In 2014, I mastered Trans Iowa. While I have been on the receiving end of no small volume of accolades from my fellow cyclists, I believe there is a road to travel that will lead you there if you care to go. The road to mastery begins many months before in the BEST (not exaggerating) gourmet taco eatery, Tacopocalypse, in Des Moines, IA. 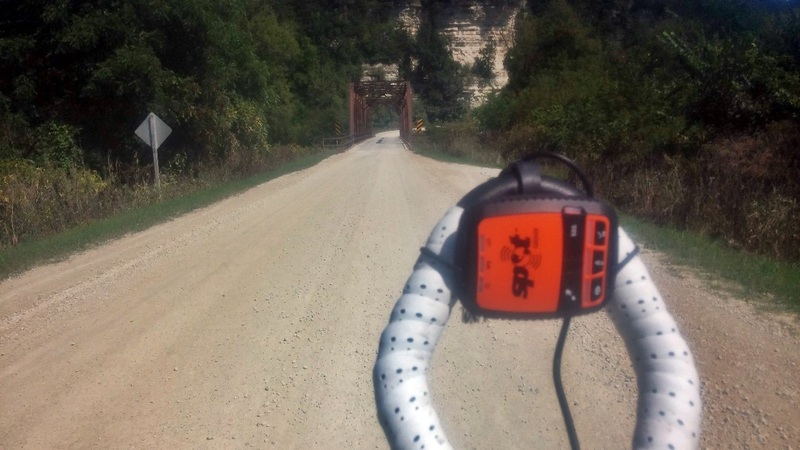 In the dead of winter, attend the Trans Iowa Clinic and take copious notes on the topic “300 Miles of Gravel.” True experts provide information appropriate gear, strategy, training and nutrition. Listen to them and learn. If you’ve followed the clinician’s instructions and want to take the initial test of your skill, send your postcard to Guitar Ted and wait to see if you make the cut. For me, my TIV10 was special because I reconnected with something from my childhood, a hunger for ADVENTURE. Growing up I rode my bike everywhere as I’m sure many of you did and TI v.10 reconnected me to that time. Thank you from the bottom of my heart Mark! I am so happy you are continuing the T.I. tradition, other still need to earn their undergrad. I hope that the journey reconnects them with something special as well!! schedule. I reviewed the rules once again discovering the program was disappearing forever the next weekend. Time to commit. I asked my lovely wife if she would be willing to come get me in Lansing, IA on Sunday (lucky for me my daughter is a freshman at Winona which is only an hour away so mom could visit.) I rearranged my schedule to make it all work. 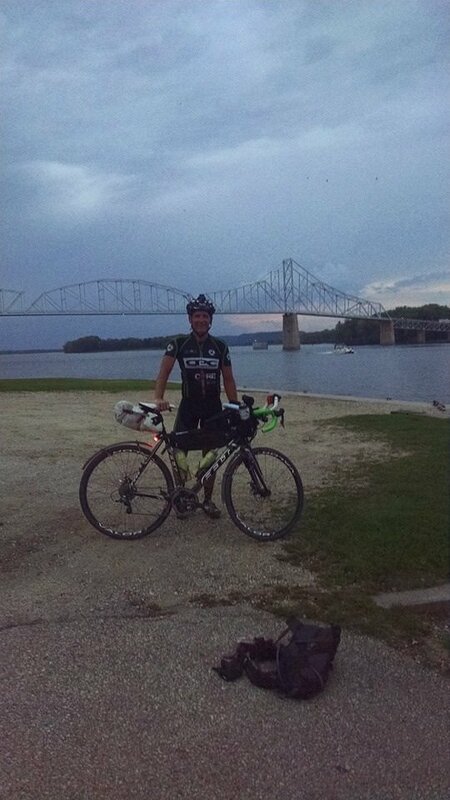 After agonizing over a starting time because I wanted to make sure to ride the northeast side of Iowa in the light to enjoy all the amazing scenery, I locked into a time of 2:00 pm Saturday and sent my TIMP-ITT waiver to Mark. I set a goal to finish before sunset Sunday. Ready to ride! 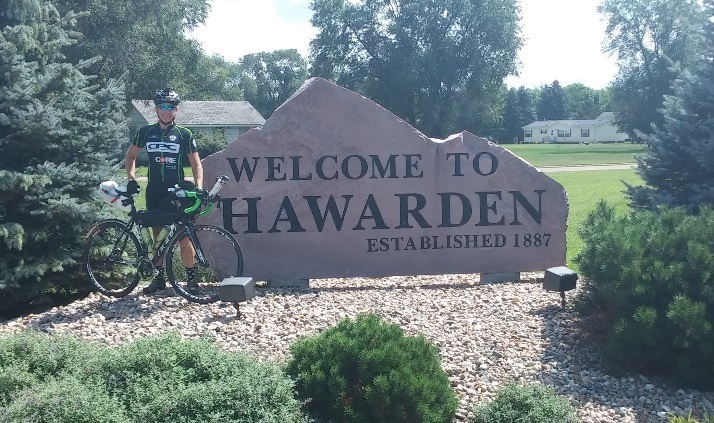 My son drove me to Hawarden, IA for the start. (Thank you TJ!) 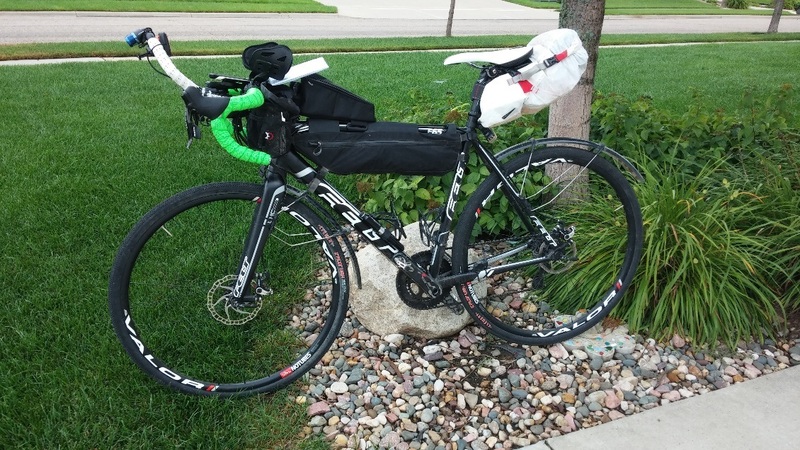 With my bike all setup and loaded down with everything I needed to get me through the nasty weather we have been having this August, I started my Garmin and Spot Tracker and started pedaling east. I wanted to get to the flatter mid-section of the course by dark because I felt it would be easy to grind through the night if I had fewer turns to worry about missing. (Yes, I miss turns.) As soon as I hit the gravel, I started to reflect on that goal. With all the recent rain, several inches in the area, the gravel was super loose like it had just been grated so I was having a difficult time finding a good line, but I did manage to keep the pace reasonable. That is until mile 26.34 when I hit the first “B” road. walk in the shoulder high weeds carrying a 50 pound bike and not knowing what was under my feet. It took FOREVER! I was losing time and starting to question my ability to finish before dark. I did not know at that time there would be two 3 mile-long “B” roads in my near future. 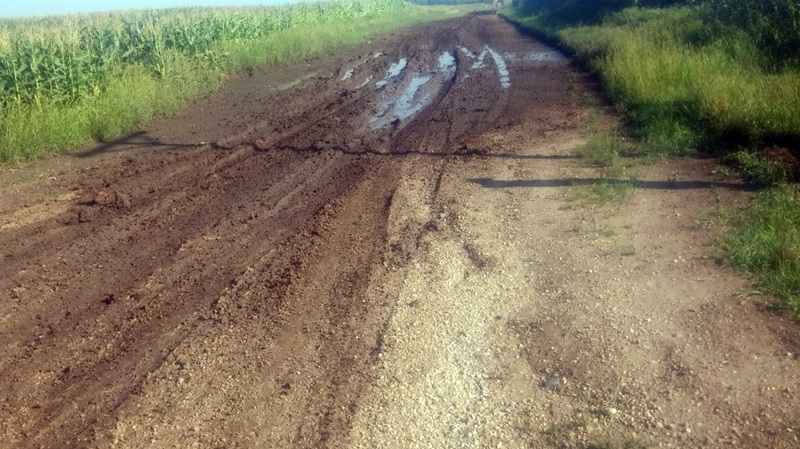 Miles 41.23 and 57 were 3 miles each of mud and weeds. A total of 7 miles of walking so far and at mile 50 one of my front spokes broke. Let the front wheel wobble begin! My time was slipping quickly and my morale was not far behind. I remember whining for mommy a couple of times (kidding around of course) trying to keep my spirits up. With my average speed well below where I wanted it at this point in the Adventure the sun was starting to set behind me, so I took the time to take some great pictures of my long bike shadow in front of me and a nice silhouette of my head. My thoughts of slipping time and itchy legs from the grass of the “B” roads started to fade. 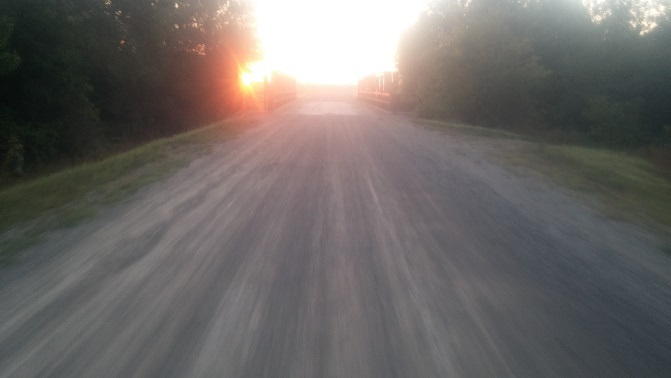 I was really starting to enjoy the gravel and my average speed was moving ever so slowly up again. At mile 67, I started to descend quickly into a river valley. Two plus miles later I popped out of the trees onto blacktop IA10 with black cat sitting in the first set of rumbles to greet me. I flew by him; he did not move an inch but I was sure I crossed his path. (Not generally superstitious, but…) With the time getting late, this could possibly be my last chance to stop so I pulled into the Car-Go Express in Peterson, IA to restock my water. After a nice chitchat with a local, I took off. 3-4 miles down the road I reached to grab my camera to take some pictures when I realized that nice local stole my camera! (Black cat at work? Hhhmmm.) Ugh!! No more nice pictures for me and all those awesome shots I got earlier? Gone! I was majorly bummed. Finally working my way out of the river valley I was starting to move quickly again. While moving along the flats at a nice pace about mile 140 I heard a loud pop come from my rear wheel. Now what?! My rear wheel had a broken spoke. Great! (The cat strikes again!!!) The rest of the ride I get to enjoy the “zip zoup” sound coming from my front and rear wheels slightly rubbing. I just prayed that they would hold up the remainder of the journey I kept moving along. The rest of the night went well until I hit Pilot Knob Park in the dark. The trail was muddy and slick, so with two failing wheels I decided it would be best to walk the entire 1.25 miles. Slow moving again, but now I had to keep my bike intact so I could finish. Once I exited the park the sun started to rise. Finally day light again! The forecast for Sunday was calling for a strong south-southeast wind and I was now entering the hilly portion of the route. My favorite part – hills! 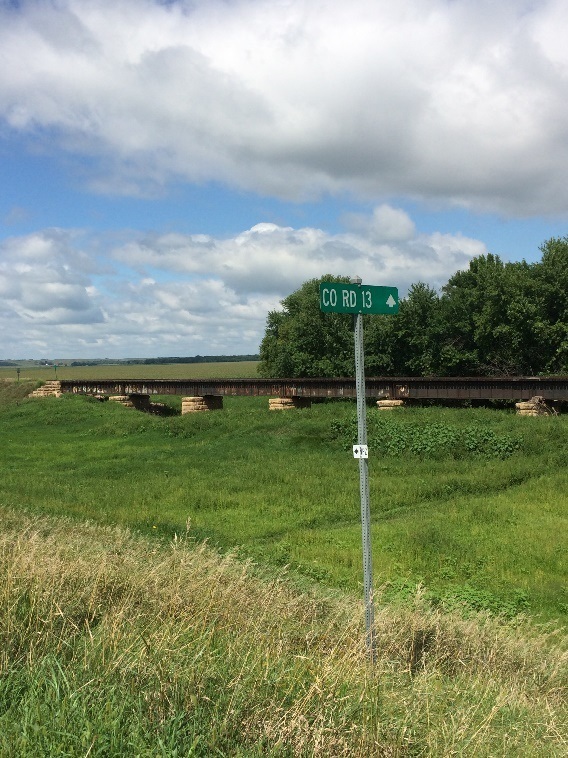 At mile 256.2 I encountered my last “B” road and yes, I had to walk most of it again. But I was confident that this would be the last one and it was only a mile long! Once I saw gravel in the distance I just about started jumping up and down with excitement. Once back on gravel I started rolling again with the “zip zoup” sounds continuing from my wheels. On my way into Cresco the wind and temperature started increasing. I was not expecting heat, so I was very surprised. I decided at this point I needed to stop to eat and hydrate in order to best prepare for the next 120 miles. I drank a 32 oz fountain Coke and bought a bag of ice to put in my bottle and Camelbak to help keep my core temp down. (I am not a fan of heat.) With everything topped off, I started the long journey to Decorah. The hills started at mile 300-ish. The rolling landscape was amazing! Here is a profile of the last 77 miles. I stopped in Decorah to top everything off again, not having a clue what was to come. 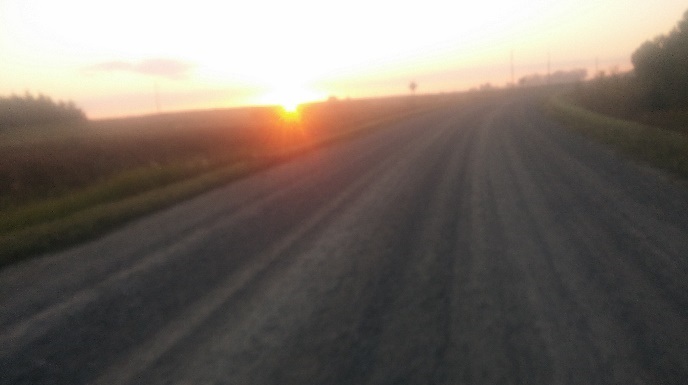 With only 47+ miles to go I started doing the math in my head as to whether I would be able to complete my ride within my starting goal of before another sunset. I was going back and forth, should be possible I concluded. Until I hit the massive mountains of Northeast Iowa. Wow! Awesome! But steep and long by my flat lander standards. So once again the math started. My confidence was slipping so I started to rationalize that at least I should finish of course unless my wheels failed. As I was closing in on my finish line, I kept looking for a water tower or some landmark to indicate Lansing was close but I saw nothing. Up and down the mountains I went hoping the end would soon be near. At mile 374 I started thinking I sure hope Lansing sits in a river valley so I can start going downhill soon and sure enough at mile 375 down I went. Two glorious miles!! Done! Goal accomplished with only 25 minutes to spare before sunset. 29 hours and 24 minutes. * Broke rear wheel skrew mile 215 trying to stop the rear wheel rubbing. o Rained hard the night before start so all the b roads were super wet and muddy. o Most in waist to shoulder high weeds. Thanks again Mark for master minding this amazing adventure for us to enjoy! It was truly amazing my friend! I founD this by accident. I enjoyed reading and digesting your adventure. All I can say is: WOW! What a son!